As Christmas day approaches, faith and family take center stage in Jake and Janetâ€™s life.Â Will Jake ever forgive Janet? Will she ever forgive him? Will they find a way to save their family home and business? Most importantly, will Mary be okay? Meet Jake McDonald, a businessman at McDonald Ranch whoâ€™s on the brink of giving up. Itâ€™s not enough that his family business is so deep in the hole that Jake is afraid heâ€™ll never dig outâ€”his wife Janet, the love of his life and mother to Jakeâ€™s infant daughter, has also asked for a trial separation. Feeling like heâ€™s losing everything heâ€™s ever loved, all Jake can do is pray. And his prayers are answered, it seems, when he and Janet begin to reconcile. Then a crisis threatens baby Maryâ€™s life and Jake and Janet are once again torn asunder. 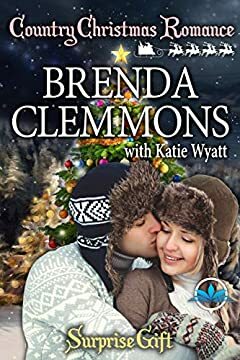 Brenda Clemmons and Katie Wyatt â€™s Clean and Wholesome Contemporary Western Romance series is enjoyable for all ages.